Brush Research Manufacturing (BRM), maker of the Flex-Hone® tool, recently introduced a new line of standard metalworking products for hard-to-finish materials. CBN Flex-Hone® tools use cubic boron nitride (CBN) abrasive for deburring, edge blending, and surface finishing cylinders made of high-nickel alloy steels. 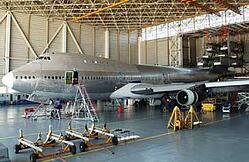 Applications include aerospace components and medical device manufacturing. Previously, CBN Flex-Hone® tools were available by special order only. Now that these surface finishing solutions are part of BRM’s standard product line, there’s a new brochure available for download. CBN Flex-Hone® tools demonstrate BRM’s commitment to solving metalworking challenges, but what else do you need to know about these flexible hones? High-nickel alloy steels combine excellent resistance to corrosion and heat with strength, toughness, metallurgical stability, and weldability. These superalloys are a great choice for applications that require chemical resistance and strength at elevated characteristics. Their material properties include low expansion at severe temperatures and creep resistance under high stress conditions. In addition to aerospace components and medical devices, high-nickel alloy steels are used in gas turbines, petrochemical and refining applications, and thermal processing. Unfortunately, however, superalloys exhibit high ductility and work hardening that can produce a gummy machining behavior. Lowering the cutting pressure and temperature to avoid work hardening can help, but surface finishing is still required. CBN Flex-Hone® tools contain an abrasive that combines high hardness with superior toughness for an optimum surface finish. The tool reduces the work-hardened layer produced by prior machining operations without imparting thermally-induced distortion. As a result, the cylinder is less prone to oxidation and stress-induced cracking (SCC), a condition caused by tensile stress and corrosion. Base metals for CBN Flex-Hone® tools include common nickel alloys such as Monel®, Inconel®, Incoloy®, Invar®, Rene®, and Hasteloy®. With their low-pressure, low-temperature abrading process, BRM's Made in the USA metalworking tools won’t disturb the underlying metallurgical structure. Plus, CBN Flex-Hone® tools can be used in handheld power tools for field repairs or production machinery for automated deburring. Standard CBN Flex-Hone® tools come in sizes ranging from 4mm to 20mm. Larger sized products from 22mm to 38mm are available by special order. As with other types of flexible hones, CBN Flex-Hone® tools are designed to be used in an oversized condition. In other words, the tool diameter is slightly greater than the bore diameter. There are three different mesh sizes: 170/200, 800, and 2500. 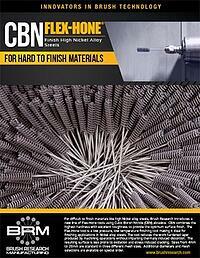 Would you like to learn more about CBN Flex-Hone® tools for hard-to-finish materials like superalloys? For complete product specifications, download BRM’s new brochure.